When booking your holiday, protecting yourself is important; once you leave the UK, the free Health Service you receive will stop. If you decide to travel without insurance and suffer from an accident or injury, there is a possibility of a large bill for treatment. Travel Insurance not only covers medical costs but also provides additional covers for cancelled holidays, delays, lost luggage and the like. Cover may also be considered for pre-existing medical conditions. Cover can be arranged based on your own individual requirements as an individual traveller, couple, family or group for single trips, annual multi-trip or even long stay trips. If you would like to receive a quotation or purchase cover from our Business Partner, please click on the following link below where you will be diverted to the Insure2Travel website. There are three levels of cover: Gold, Silver & Bronze, with a 5 day cover starting at £18.50. A full summary of the travel insurance cover can be found through our link together with the policy wording. Rates for the UK, Europe and Worldwide are available for couples, families, long stay and annual multi-trips. 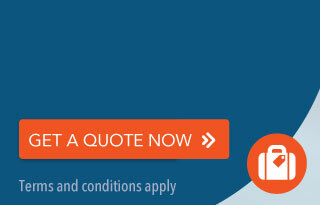 Please click on our link for any quote that you may require. Please note the rates below relate to those who will be under 65 years of age when travelling.